All the ingredients for a memorable wedding are right here. Starting with surf, sand and sun. And in Ocean City, Maryland, everything else is so close. Like restaurants, country clubs and hotels for the reception. (Many with stunning ocean or bayside views.) Florists, photographers and houses of worship. Whether you're planning a small, intimate affair or a huge gathering, OC is the ideal setting. You won't find a more family friendly atmosphere. From kids to parents to grandparents, there's always something to do in OC. Nothing says fun like beach and boardwalk. Whatever entertainment the guests and the wedding party are looking for, they'll find it all here. Most of all, when that wonderful moment arrives, there's no setting more romantic, no backdrop more spectacular than the crashing surf and the sparkling sands of OC's beautiful beaches. 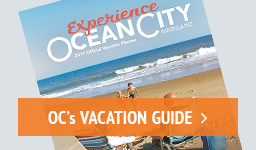 So it's no surprise that hundreds of couples choose Ocean City every year. Whatever you want, however creative you want to be, we're ready to make it happen. Nowhere offers a more romantic setting or more ways to celebrate your special day than Ocean City, Maryland. So why not start your life together here? Every year, hundreds of couples choose to hold their weddings in the festive, romantic atmosphere only Ocean City can provide. We hope you'll join them and that your Ocean City, Maryland wedding, will be the beginning of a long and happy life together. Once you've decided on an Ocean City, Maryland, wedding, your first step is to apply for a Worcester County marriage license. Call the Clerk of Court Office at (410) 632-5500 to find out what's required, and what documents are needed. If you want to arrange a beach ceremony, call the Ocean City Mayor's Office at (410) 289-8931. You'll need to provide someone to officiate, since Ocean City doesn't have a Justice of the Peace.